The Supervisor of Salvage (SUPSALV/NAVSEA 00C) received a request from the Naval Air Warfare Center (NAWC) to provide damage control and firefighting personnel, and NAVSEA 00C salvage engineering in support of the DD21 Live Fire Test and Evaluation (LFT&E) Weapons Effects Testing of the Ex-CG20 (Richmond K. Turner). The main purposes of the testing were to accumulate threat weapons blast/fragmentation effects data from selected DD21 threat weapons (anti-ship missiles), and to provide limited data and observations on the behavior of a ship damaged by weapons effects and put under tow in low sea state conditions. The NAVSEA 00C salvage engineer was responsible for providing damage predictions and assessment of resulting damage to ship stability and strength. The ship was heavily instrumented, and photographed and videotaped to record the weapons effects. The "dead ship" was prepared and towed to a testing area 75 NM south of Naval Station Roosevelt Roads, Puerto Rico. Shot 1 was an equivalent warhead to a threat anti-ship missile, placed 6 feet inboard the port side shell in a forward berthing compartment. The resulting blast and fragmentation damage removed a significant portion of the side shell and stiffeners at the location of attack (see photograph below). The damage extended from the strength deck (01 deck) to a point below the waterline approximately 4 feet below the 2nd platform deck (approximately 30' x 30', with tearing up to the strength deck). The entire attacked compartment plus the compartment forward flooded to the waterline. Subsequent to the ship's return to NAVSTA Roosevelt Roads for inspection and preparation for shot 2, slow progressive flooding through the ship's fuel oil transfer system was discovered. Apparently, several access covers to fuel oil tanks below the forward engineroom were left open. Additionally, almost all fuel oil transfer system valves were left open, allowing the water to progressively flood from the damaged compartment to other fuel oil tanks (41 tanks total), and into the forward engineroom. Subsequently, all fuel oil and drain valves were manually closed, and all tanks were opened, dewatered, verified empty, and secured. Finally, in preparation for shot 2, the ship was ballasted aft in order to limit the vertical extent of side shell damage during shot 2. Shot 2 was an equivalent warhead to a threat anti-ship missile, placed 6 feet outboard the starboard side shell of the after missile preparation room and missile magazine. In this case, structural damage was relatively minor, and no additional flooding occurred. Structural damage was limited to the area adjacent to the blast on the starboard side shell (approximately 10' x 10'), with some minor damage internal to the missile preparation room and missile magazine. Fragmentation and blast damage across the 01 deck and deckhouse were significant. NAVSEA 00C maintained an existing DETAILED model for the CG-16 class cruisers (Leahy class), which had been developed in 1990. The model, while generally accurate and applicable to the CG-20 hull, required careful checking and minor modification. 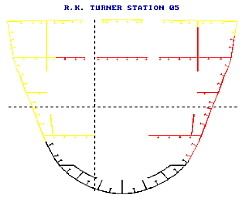 The hull offset file (.HUL) was checked against available documentation (General Arrangement Drawings and Section Scantlings). Compartment offset files (.CMP) were quickly spot-checked and re-saved in the current POSSE format, and a new compartment access file (.CML) was created. The 3 section modulus data files (.SMD) were checked against the available documentation. Hydrostatics, Bonjeans, and Cross-curves files (.HYD, .BON, and .GZ) were generated for a suitable range of drafts, displacements, and inclinations. A ship data file (.SDA) was generated, using the pre-existing file, checking designated tankage and lightship weight, and importing .HYD, .BON and .GZ files and importing desired section modulus files (.SMD) at desired strength locations. The initial condition of the ship was close to the lightship condition, but some of the topside structure and components (missile launchers, radars, etc.) had been removed in preparation for SINKEX. Thus, the initial condition load case (.LC) file was created in the Intact Loading Program by applying a "correction" under "miscellaneous weights" which would match observed drafts pierside. This "correction" would be a negative (removed) weight centered where necessary longitudinally to match observed drafts, and distributed over the length of the ship. Prior to shot 1, worst case damage scenarios were analyzed in the Salvage Response Program for both shots 1 and 2, assuming cumulative damage. The worst case flooding damage predicted included 3 compartment flooding for each shot scenario (forward and aft, as shown below), allowing all compartments to free flood (i.e. to the waterline). Worse case damaged scenarios were modeled using POSSE. 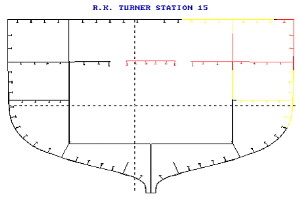 The worst case hull girder structural damage prediction (based on Naval Surface Warfare Center blast damage analysis) was applied at each of the 2 damaged sections, using the sections 5 and 15 .SMD files (see below). Structure which was anticipated to be significantly damaged was assumed to be ineffective for longitudinal strength and was removed from the section modulus calculation (scantlings in red). Where structure was anticipated to see only minor damage (i.e. where some local deformation or fragmentation damage could be anticipated) and remain practically effective for longitudinal strength, the effectiveness of the structure was reduced by applying a 15% corrosion factor (scantlings in yellow). It should be noted that the actual location of the forward damage was 20 feet forward of the section 5 location. However, it is believed that the error introduced by importing the damaged section 5 scantlings at the damage location would introduce negligible error. The location of the after damage would coincide well with the section 15 location. For each damage scenario, stability, drafts, trim, list and hull girder strength were evaluated in still water and for moderate seas (15 foot waves) to ensure the ship could execute hurricane avoidance should the need arise. Actual damage encountered as a result of shot 1 was remarkably close to the worst case prediction. Flooding of the 3 compartments forward was almost complete. However, flooding to the after of the 3 compartments could be controlled and almost eliminated (except for a small void on the port side which was holed to the side shell). Eventually, the forward of the 3 compartments was also dewatered (except for a slow leak), leaving only the attacked compartment flooded to the waterline. Structurally, the resulting damage was very close to the predicted damage as shown above. The resulting damage provided a 28.6% reduction in section modulus of the upper flange (deck), 11.3 reduction in section modulus of the lower flange (keel), and 33% reduction in shear area (from the intact/undamaged section). Prior to initiating shot 2, the test director desired to ballast aft in order to reduce potential damage to the starboard side shell during shot 2 (it was anticipated that reflective pressure of the blast off the water surface would damage the shell plating down to the waterline). Thus, 11 aft fuel oil tanks and voids were ballasted, providing 5 feet of trim by the stern prior to shot 2. Following shot 2, some of these ballasted tanks would be deballasted as necessary to adjust ship's trim to approximately 2 feet by the stern. Actual damage encountered as a result of shot 2 was much less than the worst case prediction. There was no flooding, and hull girder structural damage was limited to a 10' x 10' hole in the side shell from the 01 deck (strength deck) downward, and damage to the inboard longitudinal bulkhead and main deck immediately inboard (see below). For completeness, it was desired to evaluate the stability and strength of the ship in event hurricane avoidance would be necessary (the ship was to remain in Roosevelt Roads in the damaged condition for 3 weeks, during hurricane season). It was anticipated that the ship could either be moored in a hurricane moor in Roosevelt Roads harbor, or be towed out of the hurricane's path. Still water GMt was 4.4 feet with significant dynamic stability. Thus, stability was sufficient. In execution of the hurricane plan, it was anticipated that the worst case sea conditions would likely be less than 15 foot seas. Thus, the residual strength of the ship in 15 foot seas was investigated by statically balancing the ship on a series of 15 foot "standard" waves (trochoidal waves equal in length to the length of the ship). The maximum bending stresses were only 10.5 ksi tension and 9.3 ksi compression and occurred at the midship's section (HTS steel yield stress nominally 51 ksi). Maximum shear stresses were less than 2 ksi (at the forward damage location). Thus, despite the cumulative damage of shots 1 and 2, the ship remained very stable and had sufficient residual hull girder strength to weather moderate seas. This salvage engineering case provided an excellent application of the afloat damaged stability and strength evaluation capability of POSSE. Additionally, it provided an excellent opportunity to "test" the suitability of one of the earlier developed POSSE models for a Navy combatant (CG-16 class, developed in 1990). Due to slight differences in the subject hull (CG-20) from the class baseline POSSE model, careful checking of the POSSE model was required. This required review of all available technical documentation and comparison with some details of the POSSE model. Due to the removal of an amount of topside and other weight in preparation for SINKEX, matching the observed draft conditions (pierside) to an approximate weight condition, which was close to (but not equal to) the lightship weight condition, was required.